Are there any photos of this child looking happy? It breaks my heart to see a 3 year old looking so painfully sad. Kids at that age should be full of joy. I hope wherever she is now, she is happy and having fun. 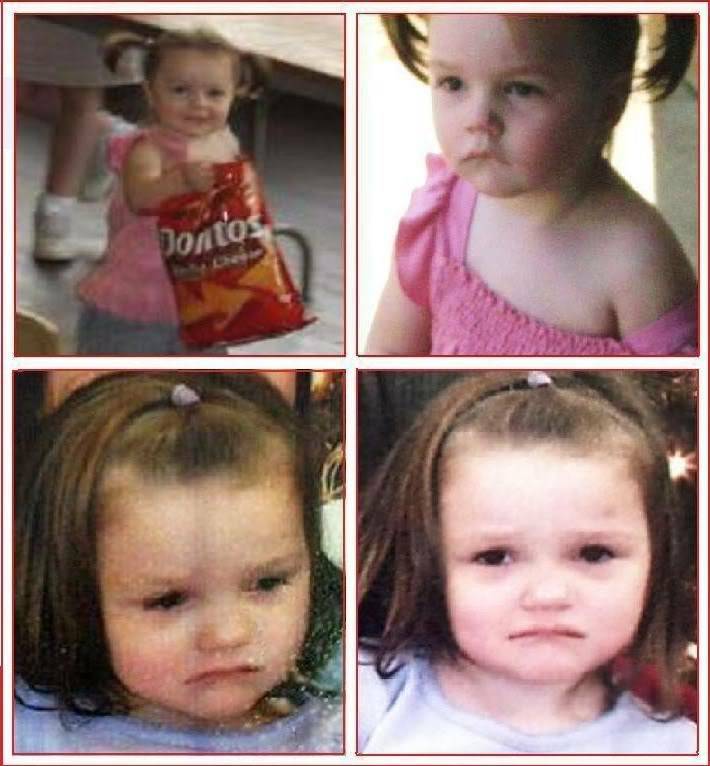 Aliayah Paige Lunsford Missing Since September 24, 2011 Have You Seen This Child? Aliayah is a 3 year old child who disappeared on September 24, 2011 from her bedroom in West Virginia. She was last seen by her mother around 6AM but was not discovered missing till about 9AM but was not reported missing until around 11:30 AM. Special thanks to Connie Lloyd for this very beautiful video! Bumping . . so this beautiful video for Aliayah is on the current page! It is beautiful, Ann...makes me want to cry. Thanks for posting, Connie did an amazing job. zombie kelli wrote: Are there any photos of this child looking happy? It breaks my heart to see a 3 year old looking so painfully sad. Kids at that age should be full of joy. I hope wherever she is now, she is happy and having fun. I have wondered the same thing, kellikat. Most of the other children on here have at least a few different poses and some happier pictures. Why is there mainly the one and only sad picture of Aliayah? The picture of her with a bag of Doritos is a little better but she still doesn't seem to be a happy child. They say that she is shy but that would not make her look this sad. I would like to see them produce some happy pictures of this beautiful little girl. Who knows? Maybe someone took her to give her a better life and she might be alive and smiling and laughing with them. That is what I wish. Saturday marks exactly three weeks since little Aliayah Lunsford was last seen. At a press conference on Friday, investigators said that it's hard to believe this little girl could still be alive. Members of the FBI, the Lewis County Sheriff's Department and the Weston Detachment of WVSP are looking over various surveillance videos, trying to piece together Aliayah's disappearance. Lessons learned? A new role model for parents who claim that their child is "missing". Just feed off the publicity until a media ho offers to represent you. Then all you need to do is answer no questions. You might even make some money from selling the rights to pictures of Aliayah. I bet they now wish they had gotten her to smile for at least one shot. Wonder how long her front teeth have been "missing". This makes me angry, disgusted and depressed. What is wrong with these families who breed throwaway children. Nobody in the family is speaking out for this little one. She is gone, but there will be, or already are, two more to take her place. No family member is pleading for her return, so it appears that she is not expectedto be found alive. Poor little child. I would have loved to find a caring set of parents to adopt her and gladly accept her as their own. I joined here to talk a bit about this little girl. I live approx. 45 miles south of where she lived when she disappeared. She and her mother used to live around in the community of Rosedale WV for a little while.Rosedale is where I am posting from. This woman,Aliayah's mother,has indeed been in and out of Jail for various things.She is or was,(I do not know about now) what we call a "Pill Head" around here. Her current Boyfriend/Husband/whatever has been in jail at the SAME time as she was and he has been in and outta trouble. Her one sons Father is a guy by the name of Travis Cook from Glenville and yes he is a Trouble maker and as of 10/15/2011 was arrested for burglary, grand larceny, possession of a controlled substance and two counts of battery on an officer. Now the Father of Aliayah is a bit more troubling to ascertain.Eric Harris is tha person she named as the Father,but here is the big wrinkle,at least for me.....Which Eric Harris is it? Or the Eric Harris I have known for years??? There are a few more pics/movies with the little girl in it. Would like to add in this Edit that Klaaskids Foundation offered their help but so far the family has refused to contact the Man in charge.They could help find her. Also a Amber Alert was NEVER sent out because there were no Description of a kidnapper or info on a car to transmit...this is where Aliayah Lunsford's Law comes into play. Welcome to RC Tweak. Sorry about the link problem. Our web host recently introduced and automatically enabled that option as an anti-spam measure, but I just disabled it because we are a site that often depends on external links. Links are up and are working. Hope I added something constructive to this.I have a special folder for this little girl in my Favorite/Bookmarks and have several links to different things. Some of the things I linked here may have already been posted here about,I am not 100% sure cause I have been reading on several forums and even Facebook about it.It tends to run together after a while. I know the family has been tight lipped and not talking to the media,whether that is buy design of the FBI or their Lawyers or what ever I do not know.I am Friends with some of the people Distantly involved though and I can say that at first they were on Facebook asking for prayers and help in her search but then it went all Hush Hush.So I do not know what is going on with the Friend that was looking for Prayers and Help in the Search. I find it VERY strange the Neighbor was outside less then 50 Feet away from the Home the little girls was living in and he claimed he never saw or heard anything unusual...this is including a Mother who was in a panic looking for a lost child...Getting in her car and going to look for Aliayah....Also the little Girl (Aliayah was sharing a bedroom with her older sister,and the older sister went to her Mothers room at approx. 6:30 am and they left Aliayah alone while Ralph Lunsford went to work.So I am sure the FBI will talk to the little Sister and the other kids.Which the CPS has removed from the Mothers custody. I am just hoping that they find her. I am also hoping that the Casey Anthony Trial does not spur or encourage others to do crazy things to their kids in hopes of a Book Deal or Talking on a Talk Show. I really wish the media would get the correct Eric Harris.If the other Eric (the one I know) is not the Father his name needs to be cleared as he does not need any more "stuff" on his plate. They need to clarify as this can damage a already fragile Reputation. Tweak wrote: There are a few more pics/movies with the little girl in it. On photobucket pics, you can copy the HTML code or the IMG code and the pic will show up here. If you use the HTML code, make sure you enable HTML in your profile. To do that, click on Profile, then click on Preferences. Then select Yes for Always allow HTML. Then go to the bottom, and click Save. If you want to upload and post pics, the following links should help. Tweak wrote: I really wish the media would get the correct Eric Harris.If the other Eric (the one I know) is not the Father his name needs to be cleared as he does not need any more "stuff" on his plate. It would be nice if the media would get the correct Eric Harris. It also would've been nice if Aliayah's mother had bothered to tell him he had a daughter. This is true.The Eric Harris I know while despite his other problems,would have tried to be in Her Life even if the mother did not want him in it. The Federal Bureau of Investigation has narrowed its search for missing 3-year-old Aliayah Lunsford, and is currently reviewing a significant amount of video evidence from security systems in the South Weston area, investigators announced during a press conference Friday. Special Agent Jeff Killeen said investigators have recovered video from civilian, governmental and business security systems. Killeen said he could not comment on what might be on the security tapes. The correct Eric Harris, not knowing he is the father, has not paid any child support. So, who is? I'm afraid I already know the answer. Perhaps neither Eric Harris is the father, and she just tossed that name out there. Oh, this poor unhappy little girl should be a wanted poster child. Thank you for all of the information you have provided. I hope you will stay to comment on other cases as well. I live out here in the country and am on Satellite Internet. We (my Family) do not have Cable TV or nothing like that and so the only real way of getting our news is to go online and look it up. I also thought to comment on maybe why this has not been covered really well. West Virginia is a rural place.The area this little girl disappeared from is just outside the City of Weston,(About a mile from the Old Weston State Hospital)And maybe 2 miles from the new "Sharps Hospital"...Mental Facility. West Virginia has DSL Internet only in Bigger areas.This may be why they never Streamed anything.Weston has DSL and to my knowledge WDTV in Bridgeport has it to. Also I take issue with the fact they never released a Amber Alert. These should be released even when NO info is available. The wanted poster of the child should be enough to get the word out. ITA, Tweak, about the Amber Alert. Get the picture of the child out there, ASAP! Quote-"The focus is narrowing, and we are working to a favorable conclusion," he said. CHARLESTON, W.Va. -- A Lewis County woman whose 3-year-old daughter has been missing for three weeks has been charged with selling federal food stamp benefits. A criminal complaint filed Monday in U.S. Magistrate Court in Clarksburg says Lena Lunsford transferred a Supplemental Nutrition Assistant Program card and personal identification number to someone else in exchange for $50 cash. The complaint says the other person, who wasn't named, intended to use the EBT card to buy $114.82 in food. Piper, the link to the info you e-mailed me last week has been on my mind ever since I received it. It is chilling to think about! I wonder if that individual might have something to do with the "disappearance" of Aliayah. As of today, I have not seen any thing in the media about it. I would think LE has asked media to not disclose the info. Piper, you know that some in the media must have done some investigative research . . . like you did! Or maybe you are a step ahead of them. P & AT Investigations are on top of the story! It's been on my mind as well, Ann. But I've haven't seen another word of it mentioned anywhere. I have not been available most of the day. I am just now getting the chance to update this thread. Lena Lunsford has been arrested, however these charges are not related to the case of missing Aliayah Lunsford. A press conference was held Monday October 17th in regards to the investigation of missing Aliayah Lunsford. At this press conference they discussed some of the details surrounding the arrest of Aliayah's mother, Lena Lunsford. Video is over 13 minutes in length. Hi Tweak ~ I have been reading the Weston Topix posts as well for weeks. I realize we can't believe everything we read, but there are some truths in those posts. I follow one from a little town in Eastern KY (where I have family) and those posters know everything about everyone in the county and up each holler, lots of pill heads ruining their lives and everyone around them. They also trash the heck out of a lot of people, too. Lunsford allowed someone to use her SNAP card. United States Magistrate Judge John Kaull arraigned Lena Lunsford, of Weston, in the United States District Court of West Virginia in Clarksburg on Monday. I hate to speculate, but selling food stamps for cash probably fits the profile of the average "pill head", or she may have figured she didn't need them anymore since she no longer has any mouths to feed. I have one question for Lena. Where is Aliayah? She sells her food stamp card on October 15th, didn't need the food for her kids because they've been taken from her! What a sorry excuse for a human being, and pretty damn stupid if you ask me. I'm glad they caught her on this. She probably needed cigs and beer, what about those unborn babies she's carrying? I hope they will be born healthy and adopted by a loving family. Justice4all wrote: I hate to speculate, but selling food stamps for cash probably fits the profile of the average "pill head", or she may have figured she didn't need them anymore since she no longer has any mouths to feed. I have one question for Lena. Where is Aliayah? And she probably needed a fix as well, her priorities are no secret. I dunno the circumstances surrounding this seems to be rather fishy in that it comes so close to the disappearance of her daughter. All one has to do is do a little research to see a list of suspects.It reads like a bad Sherlock Holmes novel. Mother,Stepfather...Stepfathers Pedo relatives,I believe its his step dad.This is not counting all the Pill heads they surround themselves with.The little girls Biological Dad in jail,the Brother to the little girl...his dad in jail to. Speaking of fix.......she should be. But I have come to realize that this old world does not always turn out a lot of people with common sense. This Woman is one big train wreck.Now that the FBI has her under their xray,its only a matter of time.I think. Tweak, so you're aware of step-dad's step-dad? These children have seen more than many of us will in our lifetime. Surrounded by druggies and criminals. Seems Lena picked her men out of a mugshot dating service, or they found her the same way. Ann - Tx wrote: I have not been available most of the day. I am just now getting the chance to update this thread. In the Press Conference video, a reporter asked if Lena was still pregnant. FBI Special Agent Jeff Killeen said he could not comment on Lena's health. In the video in the above article, the first few seconds show Lena Lunsford. She is definitely still pregnant! Tom Dyer - Defense Attorney- Offered services for free to anyone who comes forward with information on Aliayah's whereabouts/also said he received a credible tip that gives authorities reason to believe Aliayah is alive. He is supposedly Ralph Keith Lunsford Step Dad. For those wondering if she is still pregnant with the twins the answer is yes. Guess she was released because they didn't want her going into labor in a prison cell. Actually, maybe that would be best for the babies she is carrying. From her womb to a safer room with foster parents. Here is a WDTV news coverage from Oct 6th that confirms the 2 missing women were in fact related to the Step Dad. Per this article, Lena Lunsford's next court date regarding the felony charges is November 7, 2012, in federal court in Elkins, WV. She faces up to five years in prison and a $10,000 fine if convicted. 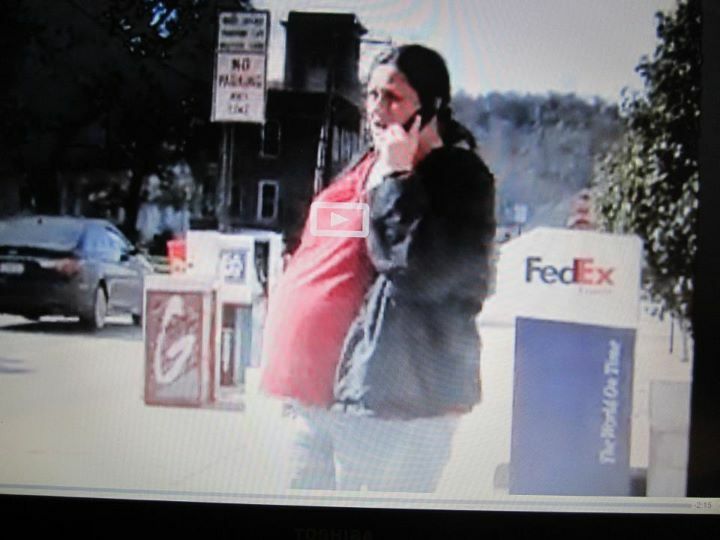 CHARLESTON, W.Va. (AP) — A Lewis County woman whose 3-year-old daughter has been missing for three weeks was arrested Monday and charged with selling federal food stamp benefits. Yeah I read that...seems like she is getting in bad trouble whether she did anything or not,with regards to the Daughter. Also read that Ralph either lost or quit his job he had at the resort he was working at. Tweak, in one of the main stream media articles posted up-thread (on one of the previous pages), it states that Ralph Lunsford has not returned to his job at the Resort since 9-24-11. Though the case of missing 3-year-old Aliayah Lunsford has not been solved, some community members are already pushing for changes to state laws. LEWIS COUNTY, W.Va. (WSAZ) – Though the case of missing 3-year-old Aliayah Lunsford has not been solved, some community members are already pushing for changes to state laws. Lunsford was last seen at her Bendale home more than three weeks ago.People are calling attention to an online petition for "Aliayah's Law." Here is another Gossip Family bashing Page from Facebook....It has several people Directly Related to Aliayah coming in and nuking the place back and forth with things like "White Trash" Loads of name calling and such. Has anyone heard whether Lena Lunsford has given birth to the twins yet? I saw the same question asked on the Hinky which prompted me to search for an answer, but I can't find one. Aren't twins normally born earlier than the expected due date? Tweak wrote: For those wondering if she is still pregnant with the twins the answer is yes. Gia-I only saw this posted here. On 10-17-11, Lena Lunsford was arraigned on the federal charges in Clarksburg, WV. The first few seconds of the video, in the above article, show Lena just prior to going into the court house. As you can see, when the video was shot of Lena in front of the Court House, she had not delivered the twins.